Hidden Hollow Hideaway ranch in Montana thrives with no ratepayer subsidy. You could say that Diamond City, Montana is a ghost town – except the ghosts have no town to inhabit. By 1870, Diamond City and the other nearby settlements in Confederate Gulch had yielded gold that would be worth, in today’s dollars, more than $2 billion. But the paroled confederate soldiers and other fortune seekers who extracted all that precious metal literally mined the town out from under itself. Today all that remains of Diamond City are rocky piles of spoils, numerous ravine-like “drifts” in which trees have long since replaced the prospectors who dug them, some dirt roads, and a cemetery. 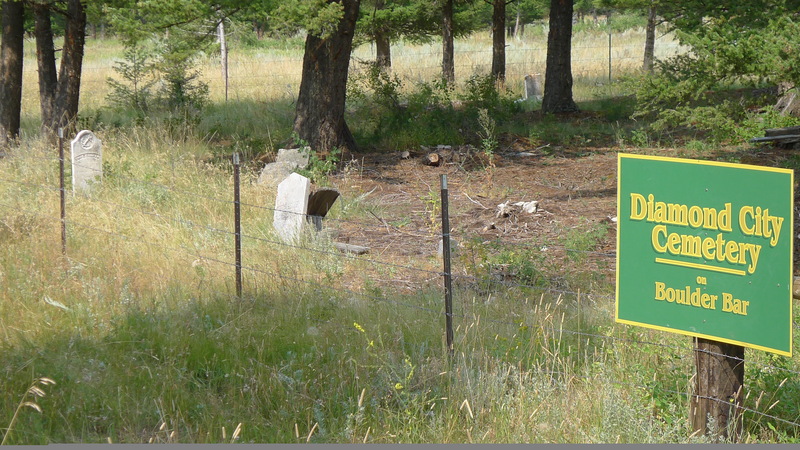 My kids and I rode past that cemetery several times on horseback on our recent vacation, since it is located on the cattle and guest ranch owned by our friend, Kelly Flynn. Some readers may recognize Kelly as the subject of the December 25, 2017 edition of this column, which described his struggle with cancer and his farewell peroration in the Montana House of Representatives after eight years of service. I’m happy to report that Kelly has so far defied the odds of his terminal diagnosis and looks almost as healthy as the horses on his Hidden Hollow Hideaway Ranch. We didn’t talk much about cancer on my recent visit. Our discussions tended to focus on politics, public service, and land stewardship – the latter a consuming passion for a man with deep family roots in the foothills of Montana’s Big Belt Range. 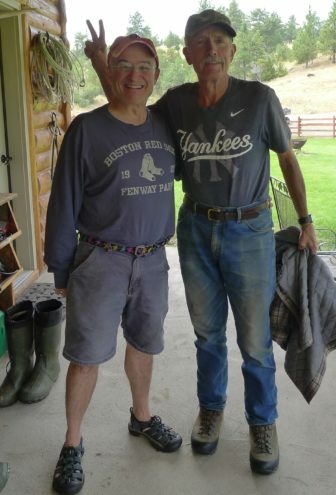 D. Maurice Kreis is pictured with Kelly Flynn on the front porch of Flynn’s ranch in Montana. I found myself thinking about the clamorous public conversation occurring back home in New Hampshire as the Legislature prepares to vote September 13 on whether to override the Governor’s veto Senate Bill 365. Because, although SB 365 nominally concerns the in-state production of electricity, it is also about land stewardship. SB 365 would continue to subsidize the state’s six wood-burning electricity generators (and its one remaining trash incinerator) at the expense of captive ratepayers. The previous subsidies that have kept these plants in business since the 1980s have either run out or proven ineffective. New Hampshire’s forest products industry has rallied around the override effort, arguing that the generators provide an essential market for what would otherwise be the waste products of the logging. They contend losing that market would be devastating. Piles of just that sort of waste adorn the back country of the Hidden Hollow Hideaway, adjacent to Confederate Gulch. 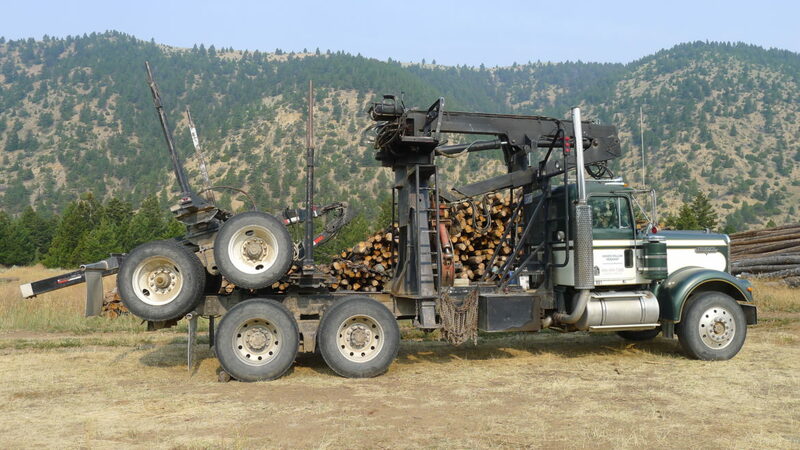 Logging is an important component of the ranch’s operations. When I was last in Confederate Gulch three years ago, the Diamond City Cemetery was literally lost in an encroaching forest of sagebrush, scrub pine and other junk growth. Today the cemetery is once more a dignified historical landmark in the middle of selectively forested grassland. Some of what was harvested went to sawmills; much is being sold as firewood. The rest is piled up to be burned, on site, once there is snow on the ground and forest fire is not a danger. Yes, it is somewhat simplistic to compare the realities of forestry in southwestern Montana to those that prevail in New Hampshire. But, still, I could not stop myself from thinking that the Hidden Hollow Hideaway has no ratepayer-subsidized generators to which it can haul, and be paid for, its waste wood. Instead, the ranch survives and maybe even thrives through the sustainable exploitation of every possible revenue stream – raising cattle, harvesting wood, welcoming trail riders in summertime and hunters in the fall. According to Kelly, he and his family work their land because they are its “temporary stewards.” They wish to pass this legacy on to future generations. With the dusty and forlorn remains of Diamond City in their midst, they see almost every day what the opposite of stewardship looks like. I believe the stewards of New Hampshire’s forests, who likewise yearn to pass their legacy on to future generations, will be creative and responsible should the subsidy for electricity produced from waste wood run out. There will be no Diamond City in the forests of the Granite State. During my recent visit to the Hidden Hollow Hideaway, I also got talking with Kelly about the realities of being a state legislator. We agreed that even in today’s intense political climate, about 80 percent of the issues are resolved in a nonpartisan if not a bipartisan way. He stressed the importance, for a citizen legislature, of good information and institutional memory so as not to allow paid lobbyists to run the show. That, too, made me think of the SB 365 discussion. With prominent sponsors in both parties, SB 365 began its journey in a nonpartisan manner. That has changed recently, perhaps as an inevitable consequence of the impending gubernatorial election and its veto by one of the candidates. As a nonpartisan public official, I find it dispiriting to see my own words hurled about in such debates. My August 12 column about SB 365 has been extensively quoted and widely criticized. Some allege that I overestimated, by a factor of five, the likely effect on residential electric customers. I have never purported to estimate the cost of SB 365 to ratepayers, which will vary depending on usage and future market conditions that are difficult to predict. Here’s the point I was making: The burden on any individual customer will always pale in comparison to the benefits of such a subsidy to those receiving them. So the beneficiaries will always be more motivated to make their case in the political arena than the ratepayer are. Just days ago, Eversource finally divested the last of its generation assets. Thus culminated the 22-year process of removing the investment risk of generation from the backs of customers. 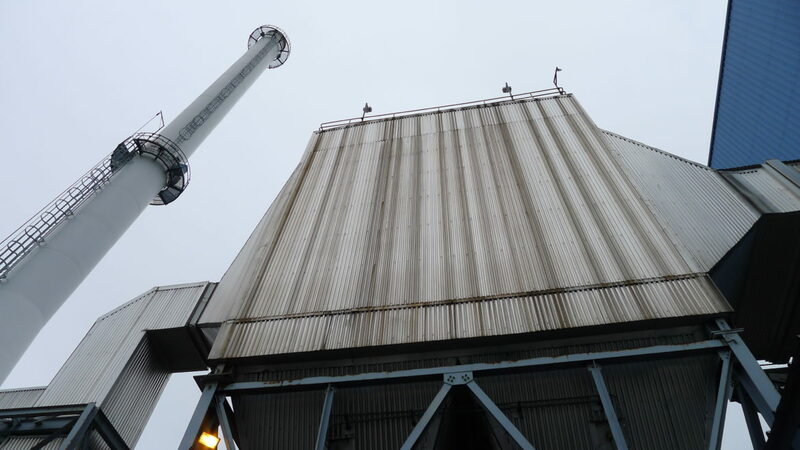 Efforts to restore that yolk to customers, whether from well-intentioned forestry folks or a 1,700 megawatt natural gas generator outside Boston (claiming it is essential for reasons of “fuel security”), are bad for ratepayers. It matters little that all such subsidies are defined as temporary. History teaches that at the expiration date, the subsidy seekers are back. And if we do not question the concept of extra money to a 20-megawatt wood burner in Springfield, or the huge Mystic Station near Boston, what will we say in a few years when it’s the Seabrook nuclear plant that wants a subsidy? Others contend I was wrong to suggest that the energy purchases required by SB 365, pegged to the price of default energy service, could ruin the wholesale market for such service and thus drive up the price of electricity for those not using competitive suppliers. The theory is that Eversource can simply resell the energy and pass along any costs to customers via its stranded cost charge, without affecting default service. Maybe. But it will still hang up the process of approving default service rates every six months. Bidders offering to provide default energy service to New Hampshire electric customers will therefore add a new risk premium to their bids, which will increase the price of default energy service. Moreover, to the extent SB 365 simply creates a mechanism for passing the wood- and trash-burners’ costs through to customers, this looks a lot like a tax. Although the proceeds would be used for beneficent purposes, including such a cost on electric bills violates a sacred principle of utility regulation: the notion that anything included in customer bills must be “used and useful” in the provision of service to those customers. Ten-thousand people once inhabited Montana’s Confederate Gulch, whose population is now zero. New Hampshire communities reliant on the forest products industry will not suffer the same fate. Sooner or later, we’ll get past ratepayer subsidies and invent a creative and flexible future for our state’s forests, as the temporary stewards of this great legacy.